Towards the end of August, or at the beginning of September, it is said that the Palomino grapes “surrender” – they turn soft and sweet. It is essential that these grapes be picked at their optimal point of ripeness which is when they reach at least 10.5 degrees Baume (a scale that measures the content of sugar in the grapes and the potential alcohol into which the sugar will later be converted). 40% of the grapes are still hand-picked but machine harvesting is beginning to take over. The Palomino grapes, which are used to produce the dry Sherries, are placed in plastic crates and are transported to the wine-presses as fast as possible in order to ensure that the fruit is not damaged. In earlier days, grapes were pressed by foot in “lagares” (large vats) by “pisadores” (grape stompers) who used special boots with nail soles designed to crush the grape skins. 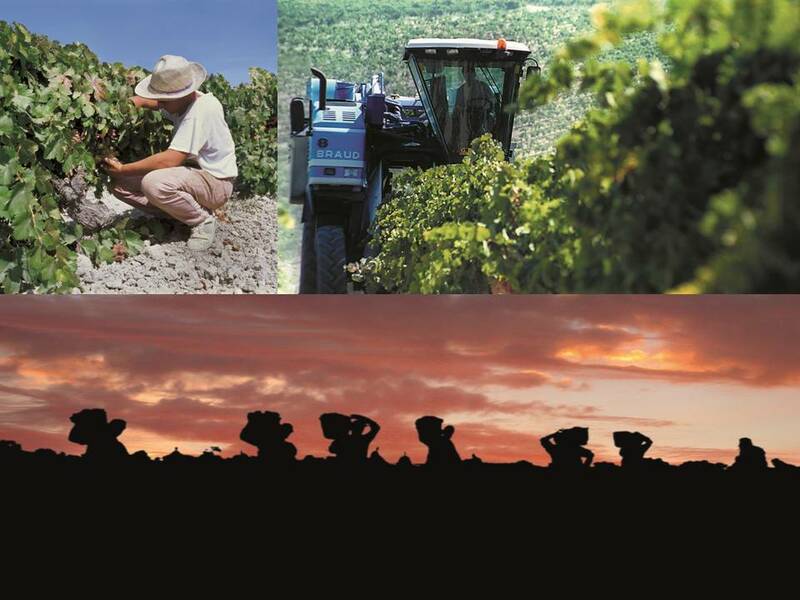 Since the 1960´s, modern machinery began to be utilized where the grapes are carefully de-stemmed, crushed, and pressed under controlled conditions. The grape juice or “must” obtained from the first pressing, through a very light application of pressure, is called the “1st yema” and is used mainly to make Manzanilla and Fino sherry wines. The “2nd yema” is the must which is obtained from a second pressing and is used to produce Oloroso type sherries. 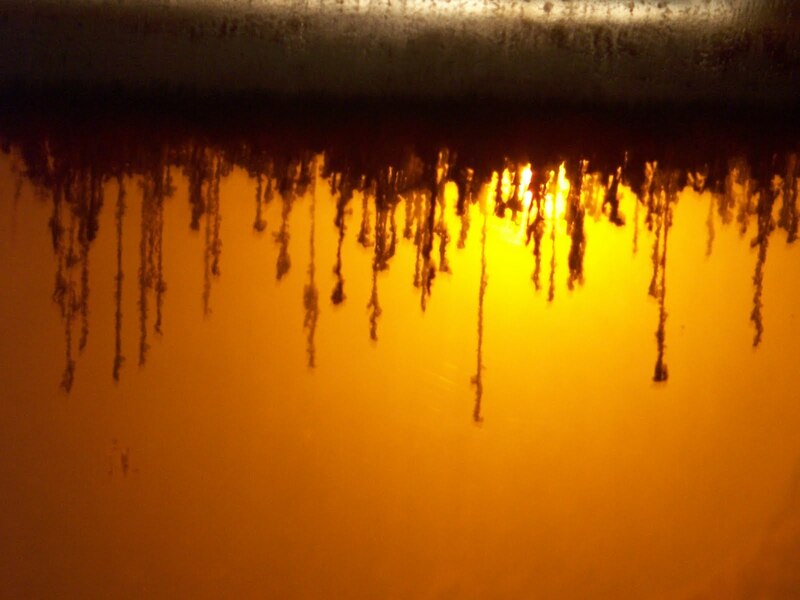 Any subsequent liquid obtained from further pressing is used for distillation and the production of alcohol spirit. As per the Regulations of the “Denominacion de Origen,” or D.O. 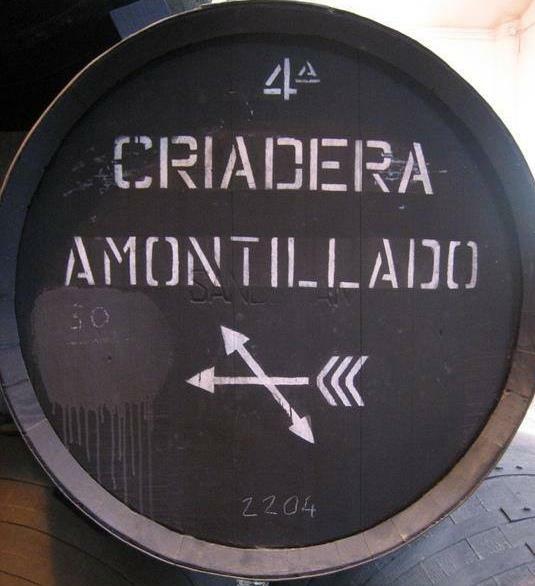 (the Authority governing the local production of sherry wines), only 70 liters of the must obtained from each 100 kilos of grapes, may be used to produce Sherry wines. After pressing of the grapes, the must obtained is then filtered and subjected to a process of pH correction which helps prevent bacterial contamination during fermentation. 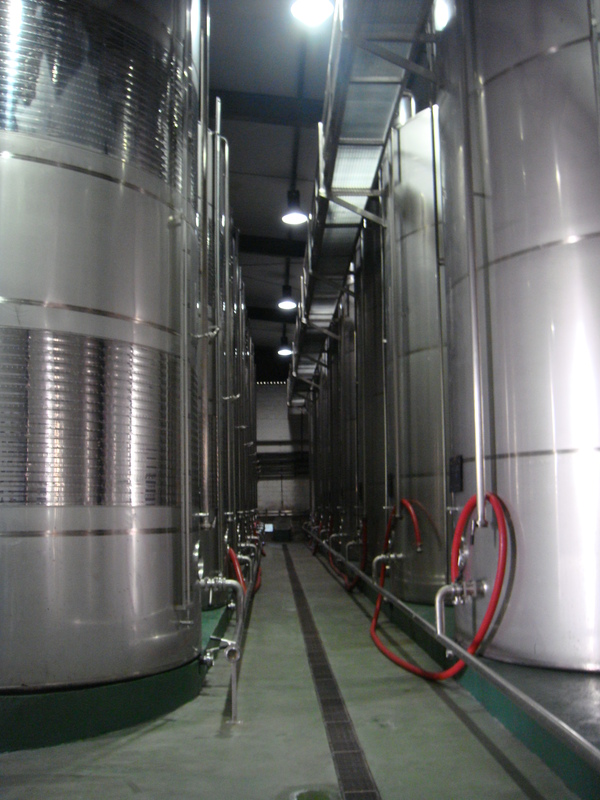 Nowadays, just a few bodegas ferment the must in “botas” (wooden barrels identified as “butts”); instead, the fermentation takes place in large stainless steel tanks where the temperature can be controlled. At this point, the wines are ready to be classified. The “capataces” or cellar masters will make the first of many important decisions which will determine the type of aging that the new wines will undergo. This first classification will divide the wines into two main groups. The finest, palest, and most delicate wines will be identified with a slash (/) and will continue their aging as Manzanillas or Finos under the velo de flor. The batches with a more robust body or “gordura,” will be identified with a circle (O) and will be aged as Olorosos. The next step after classification is to increase the wine’s alcohol strength to its optimal level. After fermentation, the base wine normally reaches around 12 % in alcohol strength. The wines classified as Finos or Manzanillas will be fortified with wine-distillate (wine spirit) to bring their alcohol content up to 15% alcohol per volume. This alcohol content creates the perfect environment for the flor to thrive and develop. 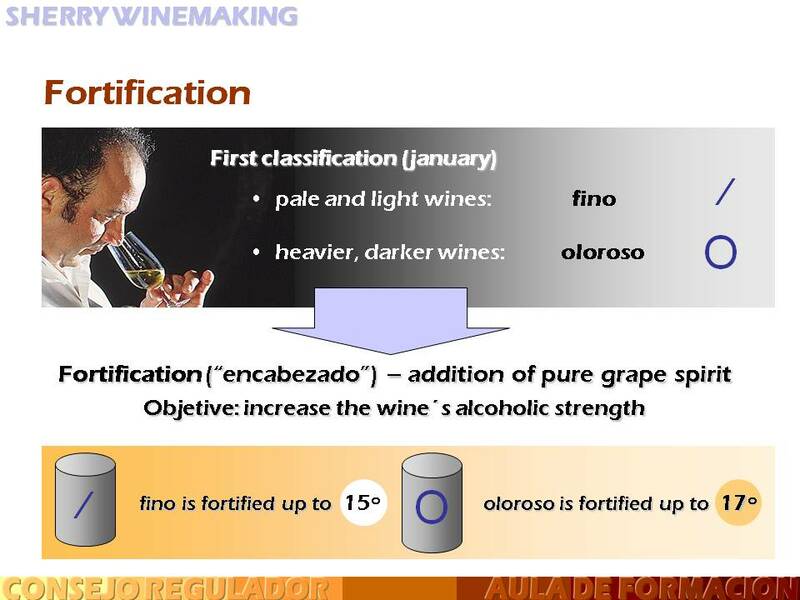 Those wines destined to become Olorosos, however, will be fortified to 17% vol. or slightly higher. At this alcohol strength, the flor cannot survive and, therefore, the wine will lose its protection from oxidation and will age while it is exposed to the oxygen in the air. The flor del vino is the most extraordinary natural element of all those which combine to produce these unique Sherry Wines. As the fermentation process reaches its final stage , the yeasts form upon the free surface of the wine inside the barrel where, with the help of oxygen from the air, they survive by metabolizing part of the alcohol and other components contained in the wine. These micro-organisms produce a film-like culture of yeasts which cover the whole surface of the wine, in such a way as to prevent direct contact the air. The wine is thus protected from oxidation, being totally covered by a natural layer of yeast. The “velo de flor” is formed by live yeasts belonging to the genus of the saccharomyces. 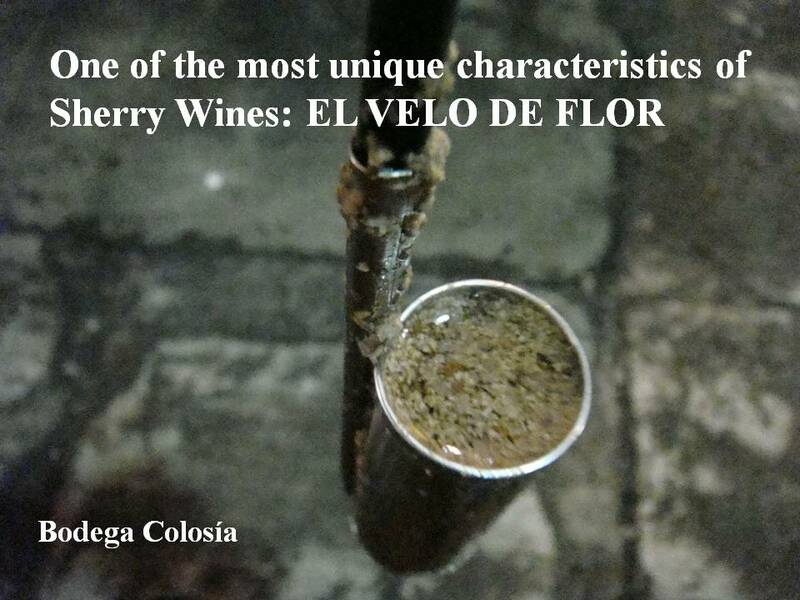 This flor is alive and is in constant and dynamic interaction with the wine. It will protect the wine from the oxidation and will consume components contained within the wine, such as the remaining sugar and glycerin, among others. All these changes will affect the organoleptic characteristics of the final wine product. 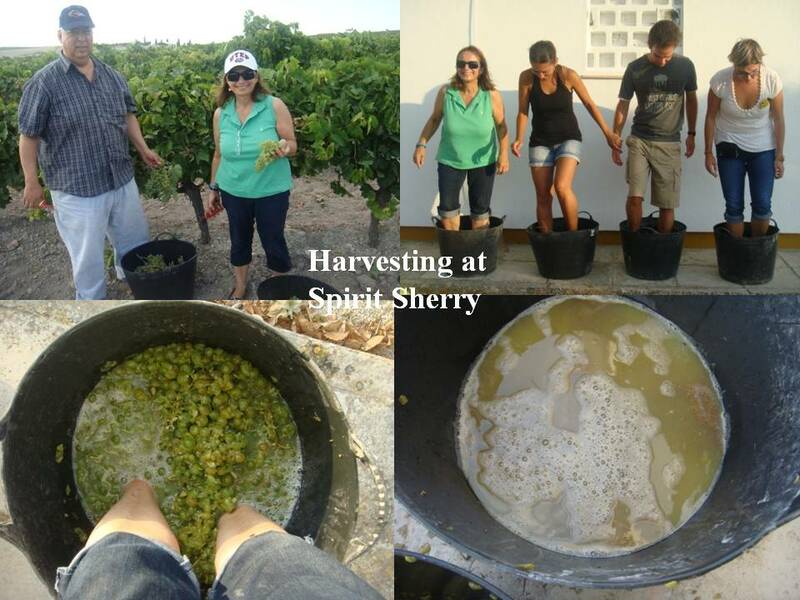 The Pedro Ximénez and Moscatel grape varieties are picked once they are over-ripe. They are then placed upon straw mats, in the open air and exposed to the sun, in order to raise their sugar content while, at the same time, lowering their moisture content through evaporation. During this “sun-drying” process, the grapes are turned a couple of times during the day and are covered at night to protect them against the moisture that comes in from the ocean. This process is known as “soleo” or “pasificación.” Depending upon climatic conditions it may last more than one week. Once the grapes are ready, they are pressed and the must, which is very dense due to its high sugar content, will be placed in tanks in order for fermentation to begin. These wines, however, will only undergo a partial fermentation in order to insure that they retain their sweetness. This partial fermentation is abruptly stopped by adding wine alcohol spirit and the wine continues its aging following the “Solera and Criaderas” system which will be explained in our next Discover Sherry article.